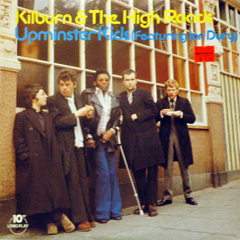 “Thank You Mum/Pam’s Moods,” by Kilburn & the High Roads « DON’T ROCK N ROLL NO! Published on November 19, 2007 in 70s, music and rocknroll. Closed Tags: 10", 1975, funky. A proto-Blockheads twofer. My love for all things Dury is not a secret. Just about everything I have that Ian Dury recorded is perfectly funky and wry. There’s one hit-or-miss 12″ from the late 80s where he has a peace symbol shaved into his head, but mostly it’s all golden. This pair of tracks from the Kilburn & The High Roads are about as early as it gets. This band opened for The Who! The songs on this 10″, in a less scratchy form, are available on Handsome. I bought this in the sad final days of Sound Exchange on Guadalupe in Austin. 30% off! Incidentally, Ian’s son, Baxter Dury, has recorded two of the best albums since 2000, in my opinion. Buy them.